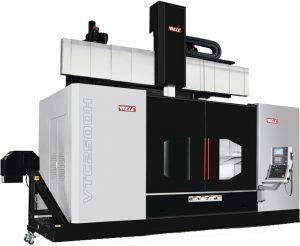 Featuring a unique blend of speed, power and flexibility, WELE Vertical Machine Centres are packed with innovative features and technology. 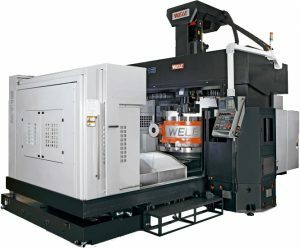 From robust machine beds to their patented ATC storage system, WELE’s Vertical Machining Centres can perfectly adapt to milling, turning, boring, drilling etc. making them the productivity standard for vertical machining. 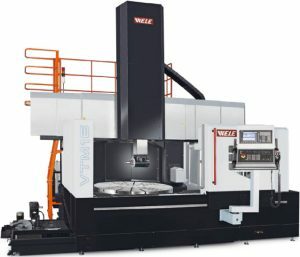 Vertical Turning center equipped with threeaxis control (X, Z, W) and table indexing enable mechanism. Robust machine bed, double column, 260 to 320mm square ram, and curvic coupling tool adaptor for high rigidity. 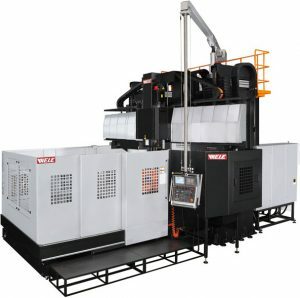 With the B-axis indexable rotation table, the single machine can functional as a vertical turning, vertical, horizontal machining center and light grinding purpose. One setup can finish whole process. Own developed hydro-static bearing offered heaviest loaded on the rotating table. Rotating table equipped with geared driven which provided 139766Nm/103086ft-lb (max.) torque at Ø4000mm table. Patented ATC storage can be assigned randomly as quantity needed such as angular head, grinding head, turning tool and vertical tools combination which we named “Puzzle ATC storage”. Heavy-duty angular head enables five-sides machining with high rigidity. Multi-task purpose provides various applications and demands : 5 sides milling and turning machining purposes for customers. MT series of all in one design concept offers multiple machining procedures: milling, turning, boring, and drilling etc. WELE own developed hydro-static bearing of rotary table unit provides the heavy loading and keep long term precise accuracy. The rotary table’s Cs axis backlash eliminated design reaches indexing in 0.001 degree incrementally. Automatic head/ tools exchange system well prepared for milling & turning purposes.